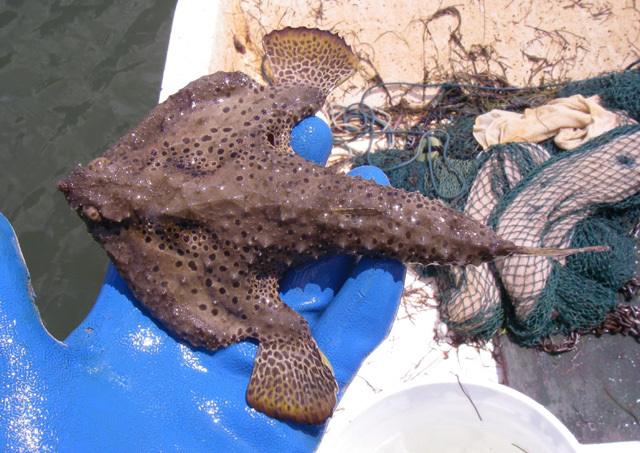 Local Florida Keys resident and commercial spearfisher, Steel Rockett, stumbled upon one of his favorite creatures during a collection trip earlier this month – a Batfish (Ogcocephalus sp). These fish are really one of a kind when it comes to their odd shape. Though as awesome as these fish are, they don't do well in aquariums, so it was returned to its home in the Gulf where it was found. Batfish are bottom-dwelling fish that can measure up to 15 inches from head to tail. They are broad, dorso-ventrally flattened, arrow-shaped fish similar in appearance to a ray. The pelvic fins are located further forward than the broad, pectoral fins which flare out on both sides, supported by arm-like stalks. The top of the head and body are covered in tubercles, giving it a rough texture and warty appearance; it does not have scales.